RatnerPrestia is a U.S. based intellectual property law firm with significant clients headquartered around the globe. Founded in 1981, we saw success through three decades of steady growth. In 2011, Jonathan Spadt became President and CEO, and the firm soon opened offices in Washington, D.C. and Munich, Germany. We now have four offices that seamlessly provide a transatlantic team of experts with broader offerings and capabilities than any other IP law firm our size. Today, RP continues to maintain a well-earned reputation for high-quality work and a flexible, business-based approach to client projects and attorney hiring. We expertly and routinely handle procurement, enforcement, licensing, commercialization, global strategic IP planning, and all related business aspects of IP. We have attorneys experienced and successful in all relevant U.S. and German agencies and tribunals, including the U.S. Patent and Trademark Office, The German Patent Office, The European Patent Office, The U.S. International Trade Commission, and Federal Courts, both trial and appellate, in both the U.S. and Germany. In jurisdictions where we do not have our own lawyers, we partner with associated firms to provide a team of IP experts capable of meeting all of your IP needs. With clients based around the world, RP understands that IP is global. There is a keystone principle upon which all of our professionals rely while building lifelong client relationships – What We Do Together Matters™. Your innovation; Your products; Your ideas – are changing the world. You are working to shape the future, and we are privileged to play an important role in that. Nothing creates more excitement in the halls of RatnerPrestia than when a client’s success is realized. Your future is why we exist. And it is with that singular focus that we handle every project. When you entrust us with your valuable IP, or when we can help you solve a problem that is hurting your business, we know that it is much more than a simple arms-length transaction. It is a demonstration of confidence, and it is something we take very seriously. We are a storied firm, but we know we are not the only organization to offer the services of people expert in both technology and law. What our clients see as unique, however, is a firm that values beyond all else the importance of the relationship. Trust, confidence, and honest communication build successful futures. 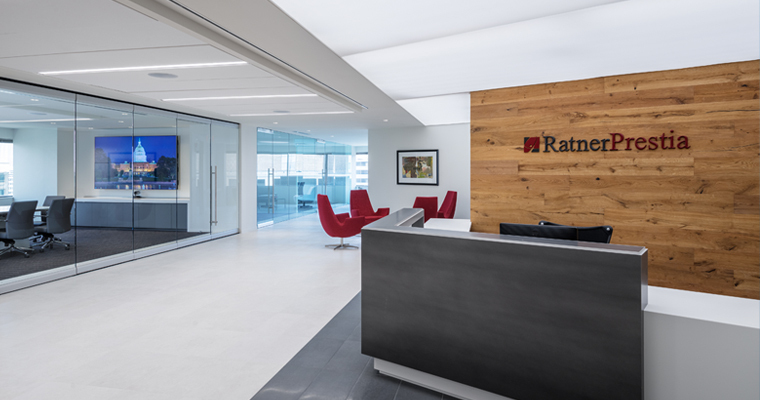 If you are considering the need for a new IP firm, let your lifetime partnership with RatnerPrestia begin with the first project. What We Do Together Matters™. This philosophy is upheld through RP’s commitment to our Core Values and Guiding Principles. We invite you to view them here.